No stranger to popular television, Scott Patterson takes on his biggest role yet. Despite numerous film and TV credits to his name, Scott Patterson will simply always be Luke Danes from Gilmore Girls to thousands of viewers—seven years on a successful show will do that to you. Now, three years after the final episode, Patterson admits he still gets approached by overzealous female fans: “I went into my bank today and I was depositing money, and all the girls came out from the back and said, ‘There’s Luke!’” Though he embraces the recognition, Patterson is hoping his latest character will make an even bigger splash. He’ll play a major role on NBC’s The Event, a new series the network is promoting as a hopeful breakout hit of the fall season. 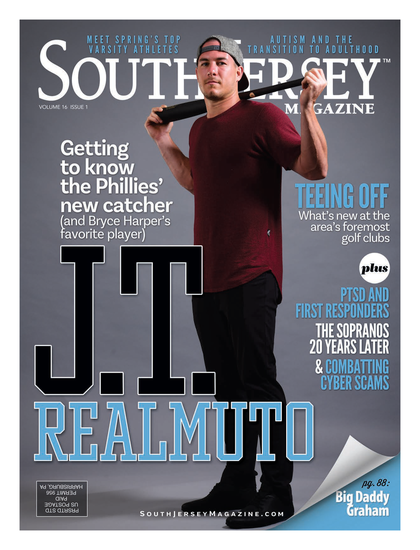 The Haddonfield native, and onetime minor league baseball pitcher, sat down with South Jersey Magazine on the set to give us the scoop on the show and why he thinks a Gilmore Girls reunion is only fitting. SOUTH JERSEY MAGAZINE: There has been a lot of promotion for The Event, and NBC really believes that the show is going to take off. How excited are you to be involved? SCOTT PATTERSON: This is the culmination of a life’s work. I thought the scale and the size of this is probably going to put it beyond my reach because of the tendency in this town to go with A-list movie talent on TV series, because of all the jobs drying up in the movie world. I never thought I had a ghost of a chance, and I am still in shock over the whole thing. SJM: The show is shrouded in secrecy, but what can you tell us about it? SP: My character’s name is Michael Buchanan. He’s a family man, happily married with two beautiful daughters. He cherishes his family life and all of a sudden is thrown into a global conspiracy, and things get totally out of control. It’s a high-octane action thriller with twists and turns. There are elements of sci-fi, and every week questions will be answered, but also new ones will be posed. It’s about the characters and how much we care about each other leading up to this global event, which I can’t reveal. SJM: The budget for the show is rumored to be astronomically high. What’s it been like to work on such a large production? SP: It feels like we’re on a $200 million feature film [set]. I’ve been in TV my whole career, and I’ve never seen anything approaching this. I read these scripts and call the producers and say, ‘Are you kidding? How is NBC affording this?’ What they are attempting here is unprecedented … conceptually speaking. SJM: This is quite the change of pace from Gilmore Girls, huh? SP: It’s a little bit of talk and a lot of action, and that show was a lot of talk and no action. SJM: Obviously Gilmore Girls opened up all kinds of new doors for you, but does there come a point when you want to leave that show in the rearview mirror? SP: That show had a huge impact on people. They watch it religiously. It’s a shame it went off the air [after seven seasons]. We never really gave the fans what they wanted, which was a wedding. We owe them the satisfaction of completion. SJM: So you grew up in Haddonfield. Any fond memories? SP: Nothing but fond memories; that town is fantastic! I still have some family and friends back there. SJM: You played minor league baseball for eight years as a pitcher. What was that experience like? SP: It’s a little strange … [it was] a long time ago. SJM: Are you a big Phillies fan? SP: When I grew up it was the Flyers [that everyone rooted for]. We would cut school and take the Speedline over to the city. I’m not really a Phillies fan because they blocked me from working out with Steve Carlton’s conditioning coach in 1982. SJM: Really? Maybe it was more Carlton’s issue and not the Phillies who had a problem with it. SP: No, it was the Phillies. He was at the end of his career; he didn’t care. SJM: Besides the show, are there any other projects you are working on? SP: There’s a lot coming in that I can’t talk about. Life has changed … it’s a welcome change. It’s very exciting times. I feel like some guy they plucked off the street to be in television. It’s not that I feel out of place, but jobs are very scarce out here now. A lot of my friends are unemployed, and they are a hell of a lot better actors than I am, and prettier too. So to have a job in and of itself is a small victory. Published (and copyrighted) in South Jersey Magazine, Volume 7, Issue 7 (October, 2010).